Does social media make room for critical thinking? Bailey, A. (2014). Teaching Alice Walker’s The Color Purple: Using Technology and Social Media To Foster Critical Thinking and Reflection. Virginia English Journal, 64(1), 17. Baldino, S. (2014). The Classroom Blog: Enhancing Critical Thinking, Substantive Discussion, and Appropriate Online Interaction. Voices From The Middle, 22(2), 29.
finding ways to capture meaningful informal learning experiences by explicitly linking these to formal structures, and providing frameworks within which informal learning can then be validated and accredited (Cedefop Report 2007). Key to using social media is the ability to stand back and evaluate the credibility of a source of information, apart from the actual content. While developing this critical attitude toward traditional media is important, the attitude is even more crucial in the context of using social media because information didn’t go through the vetting process of formal publication. Can the student corroborate the information from multiple sources? How recent is this information? Are the author’s credentials appropriate? In other words, the ability to step back, to become aware of the metatext or metacontext is more important than ever. Coad, D. T. (2013). 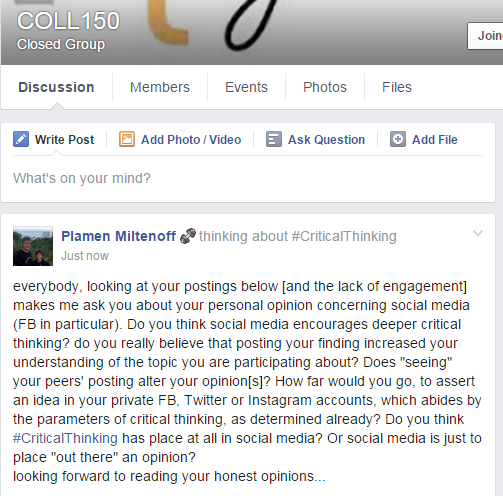 Developing Critical Literacy and Critical Thinking through Facebook. Kairos: A Journal Of Rhetoric, Technology, And Pedagogy, 18(1). Many instructors believe that writing on social networking sites undermines the rhetorical skills students learn in class because of the slang and abbreviations often used on these sites; such instructors may believe that social networks are the end of students’ critical awareness when they communicate. Johndan Johnson-Eilola and Stuart A. Selber (2009) contended that electronic writing forms actually require “sophisticated skills of understanding concrete rhetorical situations, analyzing audiences (and their goals and inclinations), and constructing concise, information-laden texts, as a part of a dynamic, unfolding, social process” (p. 18). It is this dynamic process that makes social networking a perfect match for the composition classroom and for teaching rhetorical skills: It helps students see how communication works in real, live rhetorical situations. Many students do not believe that communication in these media requires any kind of valuable literacy skills because they buy into the myth of how the news media portray social networks as valueless forms of communication that are decaying young people’s minds. This is why I introduced students to the passage from Invisible Man: to get them thinking about what kinds of skills they learn on Facebook. I found the text useful for helping them acknowledge the skills they are building in these writing spaces. Stuart A. Selber (2004) in Multiliteracies for a Digital Age criticized so-called computer literacy classes for having “focused primarily on data representations, numbering systems, operating systems, file formats, and hardware and software components” rather than on the task of teaching students to be “informed questioners of technology” (p. 74). In a time when, as Sheelah M. Sweeny (2010) noted, “the ability to stay connected with others is constant,” it is increasingly important to engage composition students in critical thinking about the spaces they write in (p. 121). It is becoming clearer, as technology giants such as Google® and Apple® introduce new technologies, that critical literacy and critical thinking about technology are necessary for our students’ futures. p. 172 there is no doubt that digital technologies and social media have contributed to a major alteration in people’s interpersonal communications and relational practices. Inter- personal communications have substantially altered, at least in Western and developed countries, as a result of the culture of increased connectivity that has emerged from social media’s engineering sociality ( van Dijck, 2013 ), which allows anyone to be online and to connect to others. Physical presence is no longer a precondition for interpersonal communication. If ISIS’s images and drone strikes are symptoms of a necrophilous orientation in human-computer interaction today, what implications are there for those of us who maintain that digital technologies should be advanced toward a biophilous orientation that“ wish[es] to further growth, whether in a person, a plant, an idea, or a social group” (Fromm, 1973, p.365)? Computers and the software they run are not magic. Nor should they be perceived as such. Learning to code is not valuable because everyone needs to program computers, but because such an integral part of modern life needs to be understood at a basic, comprehensible level. danah boyd, a professor at Harvard University’s Berkman Center for the Internet and Society, argues that teenagers closely scrutinize what they share online because it is a way for them to negotiate their changing identities. In her book, It’s Complicated: The Social Lives of Networked Teens, she describes how teenagers carefully curate their feeds based on the audience they are trying to reach. Adolescents have been migrating away from Facebook and Twitter over the last few years, showing preference for sites like Snapchat, Whisper, Kik, and Secret that provide more anonymity and privacy. Part of this transition can be explained by the fact that the older social media sites stopped being cool when parents joined them, but perhaps another reason could be that teenagers growing up in the post-Snowden era implicitly understand the value of anonymity. For teens, it’s not a matter of which platform to use, but rather which works best in a particular context. Limits on screen time may remain important in restricting use that is passive, sedentary, or noneducational, and they may also prove useful in ensuring that children engage in a balanced combination of activities. However, a more-comprehensive definition of developmentally appropriate technology use will empower ECE providers and families to make better decisions about the ways in which young children use technology–and help maximize the benefits young children receive from this use. Hong Kong, Switzerland and the Netherlands rounded out the top 5 with average Internet speeds of 13.3Mbps, 12.7Mbps and 12.4Mbps, respectively. America’s national average of 10.5Mbps placed it in the No. 12 position globally.